If you happen to have £5,000 burning a hole in your wallet at the moment, you may be interested to know that this fantastic watercolour by Thomas Rowlandson will be going under the hammer in London in a couple of weeks time. 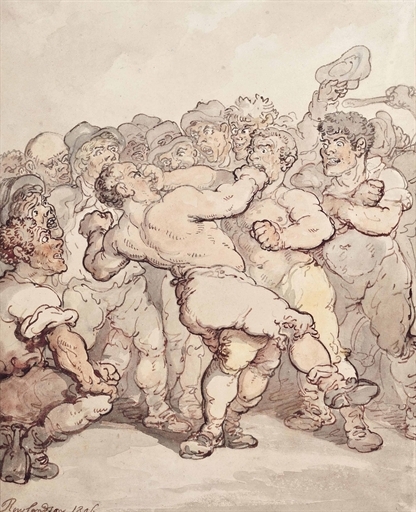 It’s signed and dated 1806 and was later used as the basis for a print entitled Description of a Boxing Match, which the artist published on his own account in June 1812. The present is a season of ferment and riot. The old cry against forestallers has been raised again with more violence than ever… There is no weak, no wild, no violent project, which did not find countenance in some quarter or other… [T]he multitude began to pursue their usual course of providing in the shortest way for their instant wants, or of terrifying, or punishing those, whom they had been taught to consider as their oppressors. When Burke sat down to write his Thoughts and Details on Scarcity in November 1795, he did not have to look far to find an explanation for the severe recession that had taken hold of the British economy during the previous twelve months. In the lengthy preamble of his memorandum, he noted that the “dry and burning summer” of 1794 had given way to a prolonged winter of “unnatural frosts” and torrential rain which had “utterly destroyed” the new year’s harvest. Crops of wheat, rye, barley, beans, turnips and peas had failed all across England, whilst livestock and dairy farmers were forced to cull there herds as they found that even the grass in their pastures had been “killed to the very roots”. By April the price of bread, the staple food of Georgian England, had shot up by 40%, while the cost of meat, butter, milk, cheese and vegetables, virtually doubled. The failure of the harvest had also produced widespread unemployment in a nation where the majority of the population still relied on agriculture for their living. 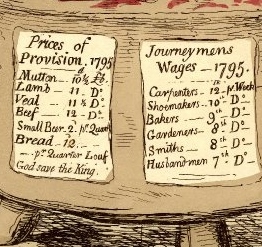 By the spring of 1795 many British households found themselves being viciously squeezed by a pincer movement of high inflation and falling wages, with a loaf of bread now costing more than the daily wage one could expect to earn in most manual occupations. These shortages were particularly acute across the south of England, where the remains of the shrunken harvest were often snapped up by provision merchants from London and carted off to the capital to be sold on at an inflated price. It has been estimated that London consumed almost three-quarters of the grain traded within England by the end of the eighteenth century, and in times of dearth its merchants were known to range as far afield as Yorkshire and Devon in order satisfy the rumbling guts of the metropolis. Government attempts to impose price caps on the sale of bread proved to be almost entirely unenforceable and for many people it became all too easy to blame these speculators for further pushing up the price of food. Sporadic rioting began to break out all across the southern half of England during the spring and summer of 1795. In some cases the rioters appear to have had no greater motive than to exact revenge upon those deemed guilty of profiting from the crisis. In April 1795 for example, a mob carried a ‘mourning loaf’ covered in black crepe into the marketplace at Coventry and then set about smashing the windows of every butcher, baker and greengrocer in sight. But in other areas the rioters showed a remarkable degree of restraint, with the threat of physical force being used only as a last resort in order to prevent foodstuffs from leaving the local area. In Congleton, Cheshire, a group of women seized an outbound wagon carrying wheat and oats in October 1795, forced the driver to return to the centre of town and then presided over an impromptu auction of the goods which were sold off at pre-shortage prices. At times it appeared as though the riots risked pitching the country into a full-blown revolution, as reports began to filter into London that units of militia and regular soldiers were siding with the rioters. In Wantage, Oxfordshire, troops from the 114th Regiment marched into town to protect local businesses and then turned on the horrified proprietors and ordered them to immediately lower their prices. Men from the 112th went even further, seizing cartloads of provisions as they entered the town of Wells in Somerset and then selling them on cheaply to the hungry locals. Surprisingly, given the degree of coverage which the riots received in the press and Parliament at the time, the unrest of 1795 does not appear to have made much of an impression on contemporary caricaturists. The British Museum’s huge collection of eighteenth-century satirical prints contains only a handful of designs which refer to the food shortages and the unrest that followed. The explanation for this is probably twofold; firstly, because the worst of the rioting took place in the provinces and English caricature in this period was often myopically indifferent to events that occurred beyond the immediate confines of central London. And secondly, because a lot of the more radically-inclined prints which were produced during 1795 have not survived. We know for example, thanks to an article that appeared in the Oracle of 10th July, that a radical caricature by an unidentified artist was “shewn about” the huge crowd which attended an open air meeting of the radical London Corresponding Society on 29th June. The image exhibits a large tree, with innumerable branches, from which, by way of fruit are suspended ‘loaves of bread! different joints of meat! heads of cabbage!’ a bottle, with “Gin” inscribed upon it. Under these several men are sitting, with their mouths wide open and these words printed on a label – “if you don’t fall I must rise”. The Ministers and other personages are represented at some distance diverting themselves with the misery of the scene. However, no copies of this print are known to have survived and therefore our understanding of the caricaturists response to the grain riots is inevitably skewed towards the more collectible output of the fashionable West End print shops. The historian Diana Donald describes this print as an attempt to “exceed, perhaps even to burlesque, the emotional violence of the radicals” and whilst it was certainly one of the most outspokenly critical satires which Gillray was to produce during 1795, it reflects Foxite demands for government intervention to secure higher wages and fixed prices, rather than adherence to a genuinely radical political agenda. For confirmation of its mainstream political credentials we need look no further than the figure of John Bull, who is shown accepting his fate with a glum but thoroughly deferential silence that stands in marked contrast to the threatening tone of the radical satire described by the Oracle newspaper. 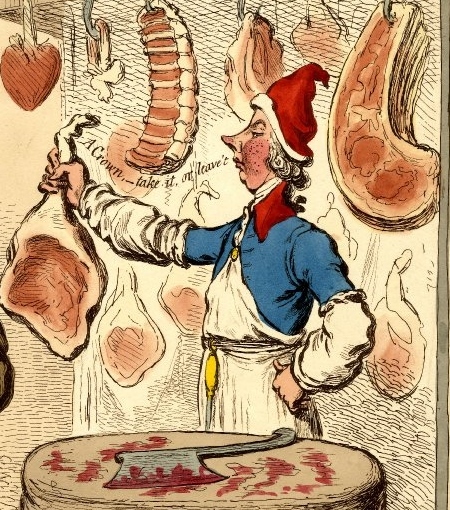 Ultimately, Gillray’s John Bull is intended to be an object of pity for the paternalistic middle class consumer, rather than a radical symbol of working class defiance or self-liberation. The representation of radical agitators and their followers as subhuman halfwits in prints such as Copenhagen House (1795) and London Corresponding Society alarm’d, – vide guilty consciences (1798), also provides us with further evidence with which to dispel any notion that Gillray was sympathetic to the reformist cause. It’s after Gillray you mug! 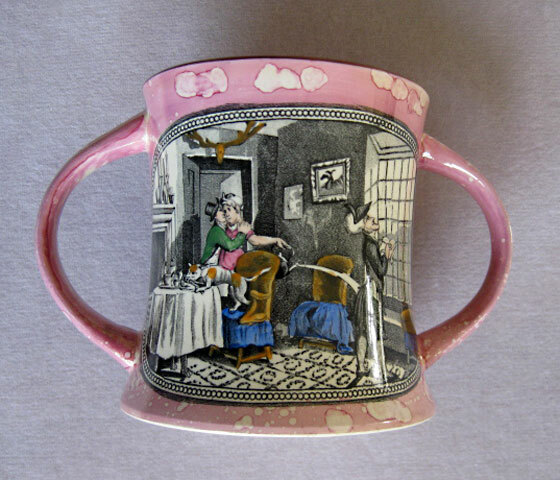 We like a bit of caricature-related pottery round our way and this mug is one of the nicest examples of transfer-printed English creamware that we’ve seen in quite some time. The design has been lifted from one of the panels of James Gillray’s famous French Liberty, British Slavery (1792). 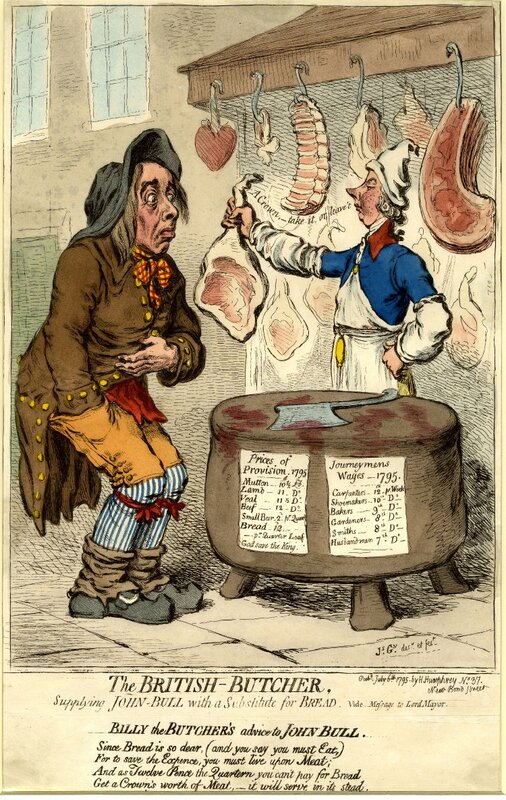 The print presents us with a contrasting view of the emaciated French revolutionary, gloating about his freedom as he gnaws on a raw onion, and a fat Englishman who moans about taxes as he sets about a side of roast beef and a pint of ale. The conclusion we are expected to draw from this is clear: Abstract notions of freedom are well and good but they are as nothing when compared with the stability and economic prosperity which are the hallmarks of the British constitutional settlement. Given that much of the humour of the original design is thought to have come from the juxtaposition of the two characters, you’d expect that this mug was part of a pair and that there would be a companion piece somewhere out there with French Liberty printed on it, right? Well, no actually. 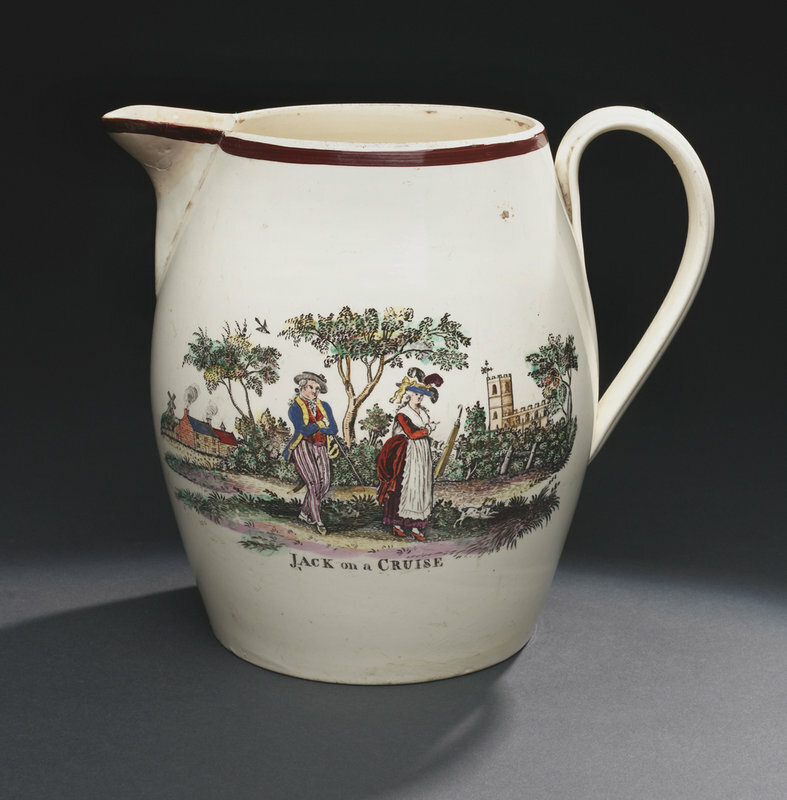 British Slavery was copied onto creamware tankards by at least two different pottery manufacturers and as yet there are no known examples of similar items carrying the other half of the original design*. This raises some interesting questions about contemporary responses to Gillray’s image. The decision to discard the contrasting image of the Frenchman transforms British Slavery into something far more innocuous and ephemeral; turning the figure of the Englishman from an emblem of Burkean conservatism into a harmless celebration of the joys of beer and beef. 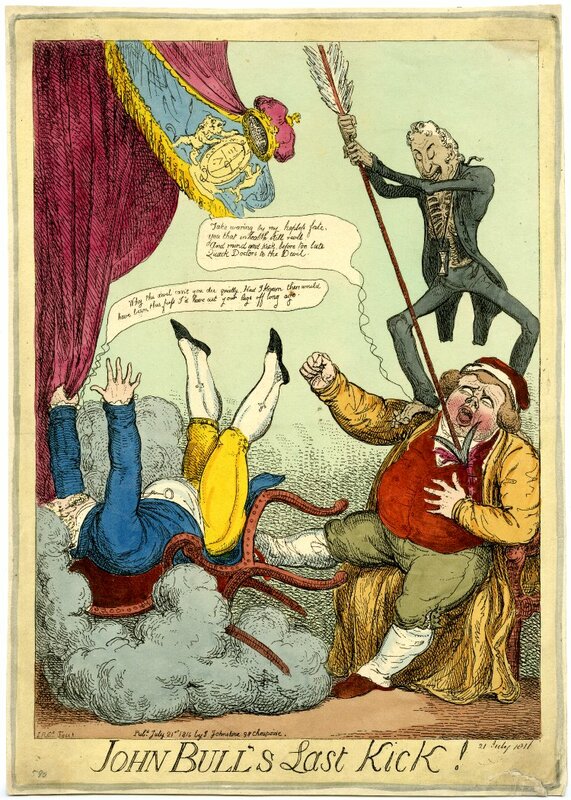 It therefore prompts us to ask whether political satire was as popular or as influential as we tend to assume and if contemporary viewers were far more familiar with the comic figures of genre, like Toby Fillpot, Jack Tar and Doctor Syntax, than with the political prints which dominate the history of British caricature in this period? Supersize vs Superskinny. 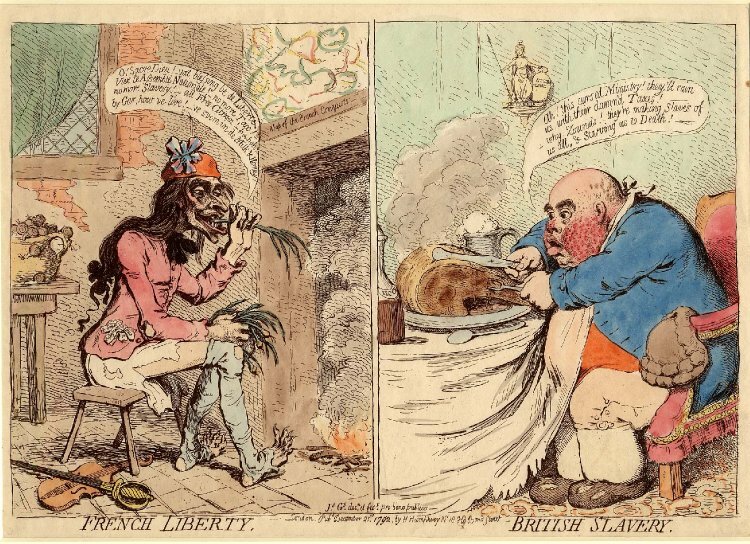 James Gillray, French Liberty, British Slavery, 1792. * Both images appeared on a creamware jug produced by one of the Liverpool potteries sometime during the 1790s, but this is the only ceramic version of French Liberty that I’ve been able to locate. See Drakard for further details. On 15th August 1822 the MP Robert Peel, who was accompanying George IV on a visit to Scotland, handed a note to the King shortly after the the royal yacht had carried them into the port of Leith near Edinburgh. The note had been dispatched from London by the Prime Minister, Lord Liverpool, three days earlier and it informed the King that the Foreign Secretary and Leader of the House of Commons, Robert Stewart, Viscount Castlereagh, had cut his own throat and was dead. The members of Britain’s political class were equally shocked by news of the suicide and even the most outspoken of Castlereagh’s parliamentary critics were willing to offer some words of kindness as a mark of grudging respect for the fallen Minister. “It is”, reflected the reformist opposition MP Henry Brougham, “like losing a connection suddenly. Also, he was a gentleman and the only one amongst them”. William Wilberforce, who had also disagreed vehemently with Castlereagh’s policies in the past, was also moved to write “Alas! Alas! Poor fellow! I did not think I should feel for him so very deeply.” Consequently, there was a notable lack of partisan opposition to the conclusion reached by a hastily convened inquest, which decided that Castlereagh had committed suicide in a temporary fit of insanity and was therefore still entitled to a state funeral. However, opinions about Castlereagh’s legacy were far less forgiving out in the country. For many Britons, particularly those living in the emerging industrial centres of the Midlands and the North, Castlereagh was seen as the architect of a reactionary political creed which aimed at marginalising them and shoring up the political and economic ascendancy of the affluent land-owning classes of the Tory Shires. When news of his death leaked out into the public domain it provoked howls of delight from many sections of the radical press. “Castlereagh has cut his throat and is dead!” cheered the front page of William Cobbett’s Political Register, “let that sound reach you… and let it carry consolation into your suffering soul!” Cobbett’s editorial also dismissed the suggestion that a state funeral should be granted because Castlereagh’s suicide had been caused by a fit of madness and sarcastically stated that, if this were the case, “men would no longer wonder at the miserable state in which they are; no longer wonder that famine and overproduction of food should at once oppress the land. There should be the solution to the whole wonder – A Mad Secretary of State and a Mad Leader of the House of Commons.” The radical journalist Richard Carlile was even blunter; dismissing the inquest as a whitewash, he said that Castlereagh should be buried at a crossroads with a stake through his heart and urged people to attend the funeral only in order to cheer at the sight of his coffin. The speed and severity of the radical response stunned moderate reformers and many immediately sought to distance themselves from the whooping mobs of radical pressmen. The “expressions of exultation” being voiced in some part of the country, clucked the editor of The Liberal newspaper, were “disgusting to behold”. It is notable that, for all the ink that they had spilled over Castlereagh when he was alive, London’s caricaturists also remained silent on the issue of his death. Suggesting perhaps that even the most reform-minded of the City’s printsellers were not ultra-radicals at heart. Despite widespread fears that a public ceremony would provoke rioting on London’s streets, the funeral went ahead as planned. At 8am on the 20th August the carriage carrying Castlereagh’s coffin passed slowly through the streets of North Cray as the bells of parish church slowly tolled in the distance. The carriage then picked up speed and by 1pm it had arrived at Castlereagh’s townhouse in St James’s Square. From here the funeral procession was to form and progress slowly along Pall Mall and down Whitehall to Westminster Abbey. As the procession began it was noted that most of the crowd observed a respectful silence, although accounts of the day which were subsequently published in the radical press were keen to stress any instances of jeering and booing that occurred along the route. The only moment of serious tension came, reported one of the mourners, when the funeral carriage drew to a halt at the gates of the Abbey and “a knot of fellows some 12 to 20 evidently paid and collected for the purpose, endeavoured by throwing up their hats and shouts, to excite disturbances.” However, this apparent attempt at incitement failed and once the carriage was safely inside the grounds of Westminster Abbey the coffin and its contents were finally laid to rest in a tomb next to that of William Pitt the Younger. Thus the funeral of this profoundly controversial figure was carried off without serious incident or unrest. BRITONS then who boast themselves Inheritors of the Greek and Roman Virtues, should follow their example, and by encouraging Conflicts of this magnanimous Kind, endeavour to eradicate that foreign Effeminacy which has so fatally insinuated itself among us, and almost destroy the glorious spirit of British Championism, which wont to be at once the Terror and Disgrace of our Enemies. – Handbill for Broughton’s Amphitheater, 1747. It was with rhetoric such as this that the retired boxing champion Jack Broughton sought to persuade the young gentlemen of London to come forward and receive tuition in the “manly art of boxing” at the training academy which he had founded on Oxford Road in 1743. Boxing was already undergoing a process of cultural transformation by the time Broughton published his advertisement and ultimately this was to see the sport elevated from the realms of the street brawl and the circus tent to sit alongside hunting, riding and fencing, in the pantheon of sports enjoyed by the wealthiest members of Georgian society. 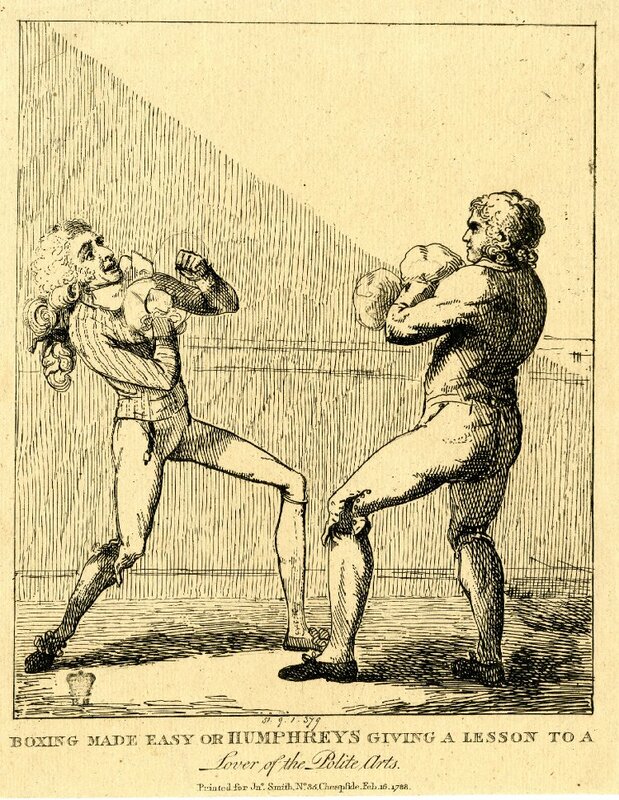 Boxing’s appearance in satirical prints during the long eighteenth-century therefore reflects both the growing awareness and popularity of the sport among the middling and upper-class customers of London’s print shops and also tells us something about contemporary notions of politeness, class and gender. The use of weaponry was to remain a common, even dominant, feature of the prize-fight until well into the eighteenth-century and in some cases fighters were given more recognition for their skills with the blade than they were for their abilities as a boxer. 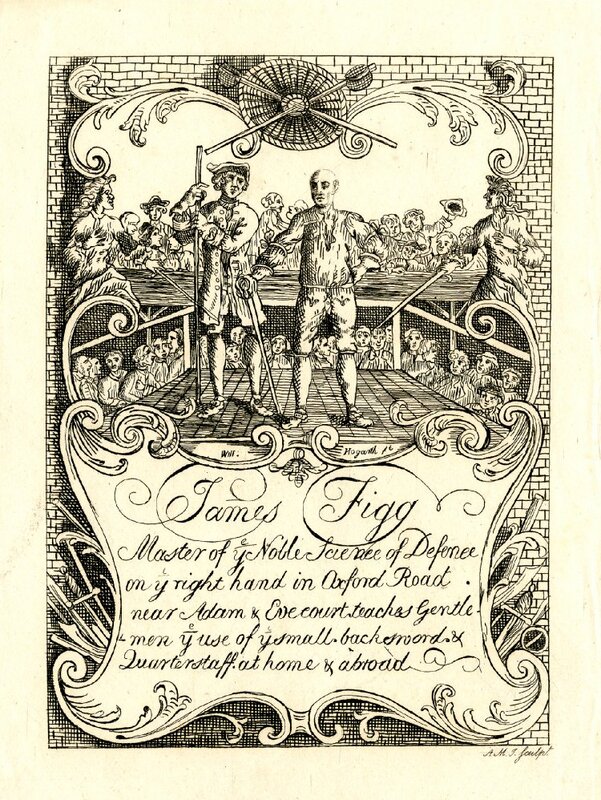 For example, the advertisements which Hogarth produced for the prize-fighter James Figg (1695 – 1735) neglected to mention Figg’s abilities as a boxer and yet he was famous for having won all but one of the 270 matches he fought. It’s an omission which reflects the attitude of Figg’s wealthy patrons towards a sport which was still largely seen as being the sole preserve of the lower classes. One contemporary pamphleteer summed these views up by asserting that gentlemen should avoid mixing with the “meanest rabble” at boxing matches and argued that the strength and hardiness of the boxer was little more than a reflection of his lowly station in life. Attitudes such as this were beginning to change though and by the middle of the 1740s armed prize-fighting had largely fallen into abeyance, thanks to the rise of a new cultural phenomenon based around the philosophy of the polite. Politeness dictated that differences should be settled between gentlemen in a fair and civilised fashion and its advocates became vocal critics of excessively violent practices such as dueling and armed prize-fighting. These criticisms hinged on both a humanitarian criticism of the use of potentially lethal force and a moral argument which said that it was unfair to expect amateurs to risk their lives in armed fights against trained professionals. It was, remarked one critic of duelling, “base, for one of the sword, to call out another who was never bred to it, but wears it only for fashions sake”. Boxing was to survive and flourish precisely because it could be accommodated within the sphere of the polite entertainment. This was achieved during the course of the 1730s and 40s by the gradual introduction of rules and proscribed techniques that were designed to ensure fair play and limit excessive brutality. As enthusiasm for this more refined form of pugilism began to grow among the middling and upper classes, boxing venues slowly migrated from the rural margins of London to the fashionable heart of the city. Other concessions to the tastes of a wealthier class of boxing fan included the introduction of boxing gloves, or ‘mufflers’, designed by Broughton to protect his genteel pupils from “the inconveniencey of black eyes, broken jaws and bloody noses.” By the early 1750s even those who continued to criticise boxing were willing to grudgingly acknowledge that it was “infinitely more characteristic of Old English prowess, and less destructive of human life” than duelling or the prize-fights of the previous generation. By the 1780s the patronage of the Prince of Wales, as well as the utilisation of print to bolster the popularity of champion boxers such as Daniel Mendoza and Richard Humphries, raised boxing to new heights of popularity. This prompted an influx of aristocratic fans and patronage into the sport, with various Dukes and Lords conferring handsome stipends on their preferred champion as a means of securing the substantial amounts of money that were now being wagered in West End boxing clubs. 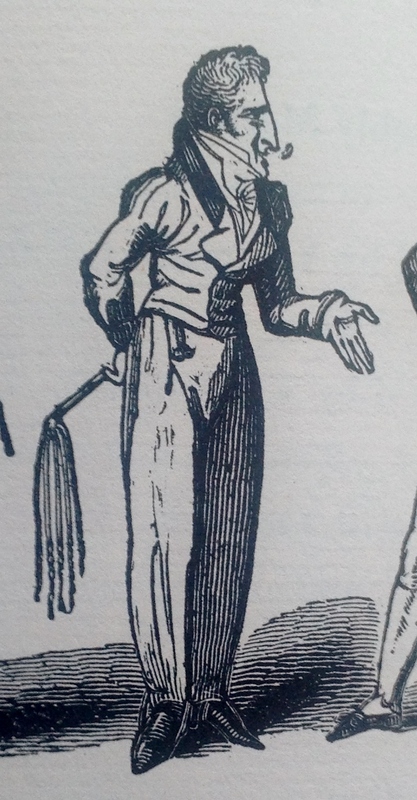 Participation levels also rose among the upper classes, with the Daily Universal Register despairingly questioning whether “black eyes and bloody noses will shortly… replace patches and dimples in all beautiful countenances” and other newspapers rushing to publicise accounts of fights featuring aristocratic pugilists such as the Earl of Barrymore. The elevation of boxing to the status of an elite sport during the final years of the eighteenth century even prompted some entrepreneurs to try hosting staged fights which conformed entirely with aristocratic principles of politeness. In 1791 when Daniel Mendoza opened his own boxing school in the Strand he informed his would-be patrons that “the manly art of boxing would be displayed, divested of all ferocity, rendered equally as neat and elegant as fencing [and] conducted with the utmost propriety and decorum.” One businessman even took this a step further by opening an exhibition near Leicester Fields where visitors could pay to watch stage-managed fights which were paused in order to allow a commentator to explain the techniques being used to the audience. This process of gentrification was ultimately responsible for the gradual decline of the original tradition of bare-knuckle boxing, which was to begin a slow retreat back to the underground during the nineteenth century. While the encroachment of the middling and upper classes into the world of pugilism may have curbed some of the excesses of the earlier prize-fights, boxing was to retain a resolutely proletarian image throughout the period and the blurring of otherwise rigid class lines which occurred at boxing matches was to become a reoccurring theme within contemporary satire. This social fluidity was not always presented in a positive light and a number of the earliest prints to feature boxing present an ambivalent or even hostile view of the upper class male who goes ‘slumming’ among the crowds at a fight. Peter Griffin’s The Bruiser Bruis’d: Or, the Knowing-Ones Taken-in (1750) for example, sneers at the wealthy young “coxcombs” opt for the unseemly spectacle of the boxing match over the glory of the field of battle at “Quiberon and Fontenoy”. 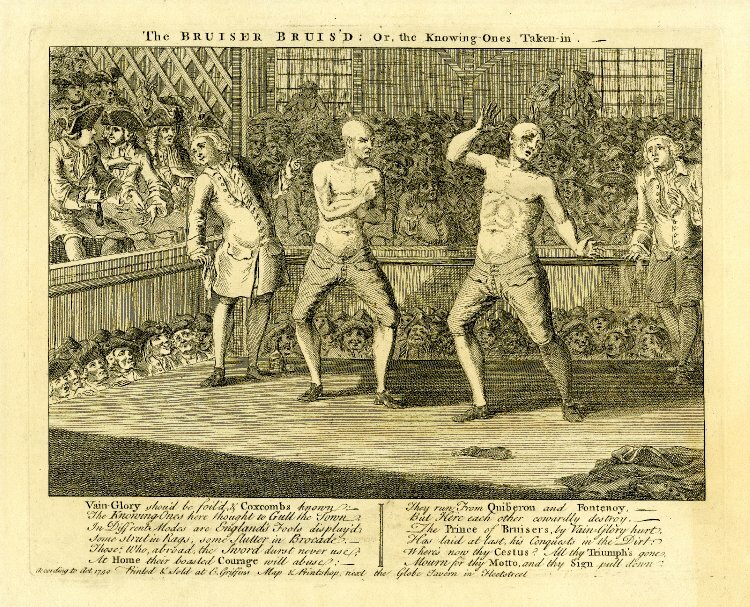 While Louis Philippe Boitard listed boxing alongside swearing, gambling and “ogling” in the list of vices that are eroding the morals of the British gentleman in The Present Age (1767). By the 1780s boxing’s integration into the world of aristocratic male entertainment had become so complete at to make further arguments about the possible dangers associated with the distortion of class boundaries effectively redundant. 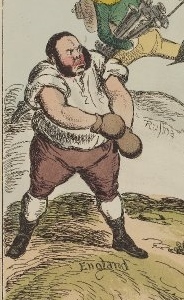 Caricatures of the late Georgian period therefore tended to unreservedly celebrate the egalitarian nature of boxing as a reflection of the liberties enjoyed by British subjects. 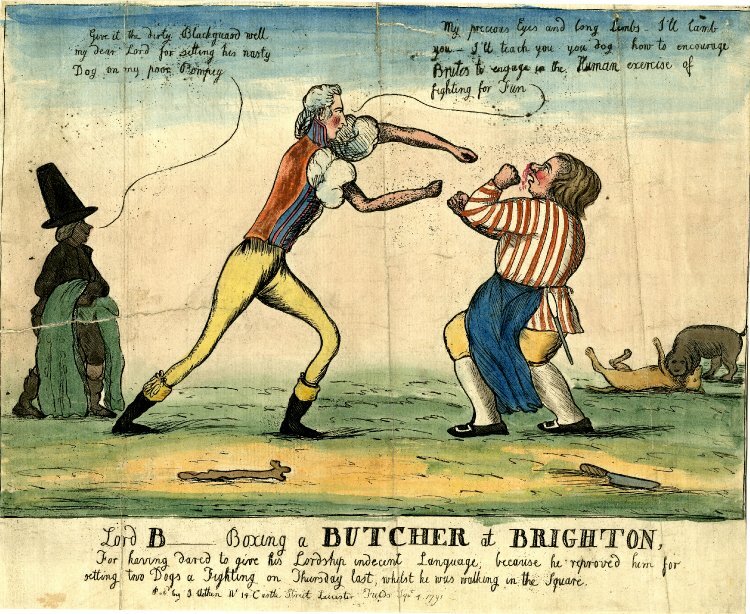 Thus we see The Prince of Wales and a butcher linking arms to carry the victorious Richard Humphries off the field in Johann Ramberg’s The Triumph (1788) and a dispute between a peer and a humble tradesman being settled by a fight in William Dent’s Lord B___ boxing a butcher at Brighton (1791). 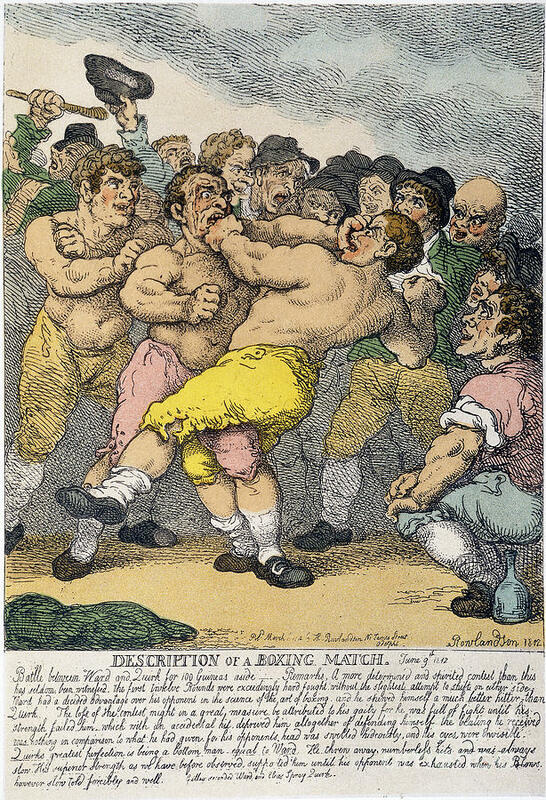 This favourable view of boxing probably reached its apogee during the Regency era, when George and Robert Cruikshank produced a wealth of prints which revel in the mixing of high and low culture at boxing matches. Robert Cruikshank’s beautiful Going to a Fight (1819) for example, the liveried carriages of the rich can be seen running alongside open wagons carrying a parties of dustmen to see a fight. Similarly, the illustrations that Robert and his brother George produced for Pierce Egan’s Life in London (1820-21) show a trio of fashionable young swells receiving lessons in pugilism and carousing with retired prize-fighters. Boxing prints also reveal something about contemporary notions of gender and the different cultural spheres that men and women were thought to occupy in eighteenth-century society. The popularisation of the sport coincided with a sudden shift in attitudes towards the playful transgression of gender roles which had characterised elite social activities during the middle decades of the century. In the wake of the disastrous loss of the North American colonies, the effeminate male ‘macaroni’ and the lady who indulged in the masculine, military-inspired, fashions of the late 1770s, were pilloried by caricaturists as symbols of national decline. Isaac Cruikshank’s St George & the Dragon & Madlle riposting (1787) reflects the mood of the times in showing the Price of Wales being reduced to tears after a scuffle with the transvestite Chevalier d’Eon. The practice of pugilism was therefore increasingly seen as a cultural antidote to the corrosive influence of dandyism and a robust physical assertion of the masculinity and marital prowess that Britons believed had made their forebears great. As Pierce Egan was to write in the introduction to his history of the sport, it was necessary for the country as a whole to encourage its men to engage in activities that “tend to invigorate the human frame, and inculcate those principles of generosity and true courage, by which the inhabitants of the English Nation are so eminently distinguished above every other country… by a native spirit, producing that love of country, which has been found principally to originate from… vulgar Sports! John Smith’s caricature Boxing made easy or Humphreys giving a lesson to a lover of the polite arts (1788), also offers a perfect summation of the juxtaposition between the heroically John Bullish figure of the pugilist and the pathetic form of the Frenchified fop. Fights between women were also generally looked on as a gross distortion of accepted gender norms and although some contemporaries were willing to grudgingly acknowledge the existence of such practices, they often went to great lengths to point out that they remained confined to the disreputable margins of society. 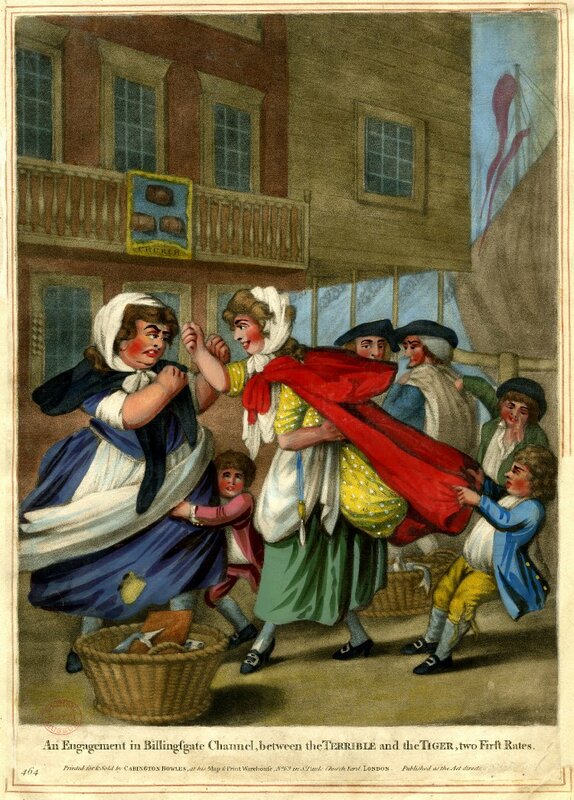 The author of an account of the fight between two women that was held in the yard at the rear of the Crown Inn in Cranbourne Alley in 1803 for example, sought to extinguish any pangs of sympathy his readers may have felt by loftily informing them that “the two females (we cannot call them women)” were residents of the slums of St Giles and well-known to the local magistrates. This is a view which is echoed in caricatures such as An Engagement in Billingsgate Channel, between the Terrible and the Tiger, two First Rates (1781) and Rowlandson’s depiction of a fight between two “drabs” in the Miseries of London (1807-08) series, which both stress the both the physical ugliness and lowly status of the fighting female. Finally, the most common reference to boxing in caricature prints was as a metaphor for the conflicts that characterised domestic politics and international affairs throughout this period. One of the earliest references to pugilism in graphic satires was A Political Battle Royal Design’d for Broughton’s New Amphitheatre (1743), which shows the various parliamentary factions preparing to slug it out in order to settle the matter of Walpole’s succession. This humorously reductive view of British politics was to remain a constant theme in English caricature throughout the eighteenth century and beyond and was to feature in political prints produced by Richard Newton, William Dent, Isaac Cruikshank and William Heath, amongst others. 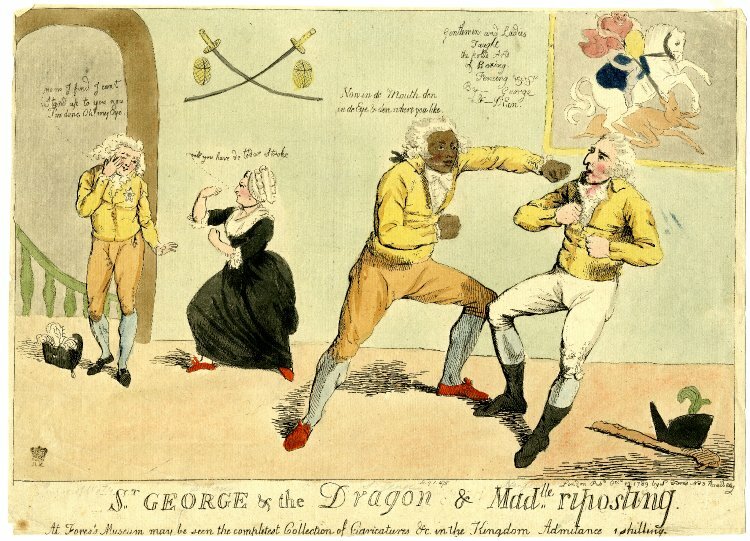 The pugilistic motif also appears frequently in prints dealing with foreign affairs and particularly those produced between 1793 and 1815, when the British love of boxing was often seized upon by patriotic writers as being symbolic of the embattled nation’s struggle against a France and her allies. 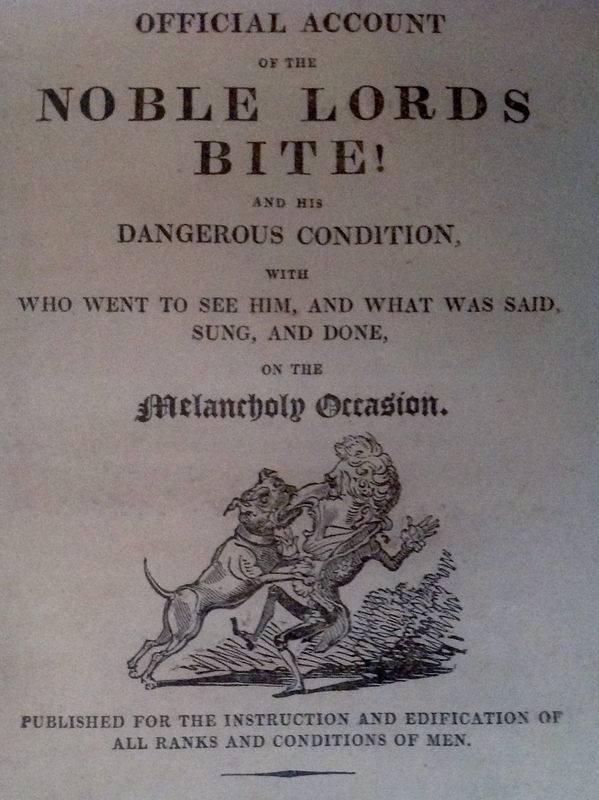 The writer William Oxberry’s introduction to the 1812 essay Pugilistica modestly suggested Britain’s love of boxing “demands the Admiration, and Patronage of every free State, being calculated to inspire manly Courage, and Spirit of Independence – enabling us to resist Slavery at Home and Enemies from Abroad”. A view which is reflected in prints such Olympic games or John Bull introducing his new ambassador to the grand consul (1803) Boxiana- or- the fancy (1815). Indeed, by the time William Heath sat down to engrave Non intervention or the peaceable appearance of Europe (1831) the figure of the pugilist had become conflated with that of John Bull himself.